Today's Fragile X Writer is Amanda Selvarajah, whom I know would be one of my best friends if she didn't live a million miles away. Amanda moved to Singapore 5 years ago with her hubby and 3 children. 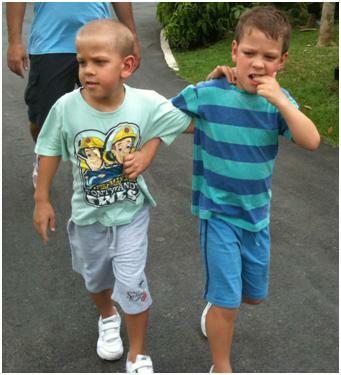 Her daughter is now 10 and in an international school and her twin boys (with Fragile X) are 7. One of the boys is on the autism spectrum and goes to a local school for autistic kids every morning (where Amanda has spent the last 3 years educating them about Fragile X); the other goes to a local special school, but not the same one. I'm especially touched by her story because her family is almost a mirror image of mine - she has an older daughter and twin boys with Fragile X. I relate, word for word, to what she says. Here's Amanda's story. “How are ya?” People ask.. well, I’ve had a pretty tough week. My eldest daughter has had a week off school but my twins haven’t (because the international and local school holidays do not overlap, except for 2 weeks over Christmas) and I’m kind of worn out from trying to make sure she has fun whilst ferrying them to and from their schools. All things being equal a week off school really shouldn’t be this big a deal, but my boys have Fragile X. My mum has it (it’s genetic – you know). I mean, I’m doing OK. But, ask me again in an hour…because it’s a fragile kind of "OK."
We don’t live on a farm. In fact, we live in a city state. 5 million people in 700 km squared. It’s packed. But so long as the boys’ personal world is not invaded, they cope. We can sit in a crowded food court with a lot of noise and they will cope. But it just takes something small ie: someone tries to clear our table. Drinks get tipped on the trays, trays get thrown on the floor and crying follows. Even planned surprises (such as dad coming home) can be too much. I get hit, their sister gets hit, crying and shouting follow. They need stroking (or brushing), holding tight with their eyes squeezed shut. Such is their need for calm stability. They’re doing okay, but it’s the fragile type. My boys like to jump. On the trampoline, in puddles, on their beds, sitting on exercise balls. This sensory diet is so essential that if it can’t be managed for a very short while (like when you’re strapped into a car seat) it tips one son in particular into a state of shut down anxiety. Eyes closed, t-shirt in the mouth, biting down with force – you know what I’m talking about. Their need is strong and their ability to stay calm without it is (erm…) Fragile. I’ve just started reading a book which might help me understand my daughters feelings towards her brothers. I’m becoming aware that this could be an issue for her in the future (like maybe today or tomorrow). She’s anxious when folks come over, when she’s misplaced a library book, when something unexpected happens. I’m watching her. Growing up with some chronic stress and unusual sibling relationships have made her careful of who she’ll invite home. Is she rightly anxious? Or is this carrier anxiety? She’s not been tested yet. We’ve discussed it. I think she’s had enough information for now. I’m carefully inching forward. Our commitment to events is fragile. "We’ll see how it goes,” “ I HOPE we’ll be there.” Should we try this? Should we go there together? My boys are so anxious, I almost daren’t try new stuff. Excitement is to be avoided. What must I remember to include or avoid in our daily activity? What might happen? Such a delicate situation. As parents we tip-toe through the days, until we find some sure footing. I know I’m exhausted, but is it long-term stress? Or is it a carrier related thyroid issue? I worry. I think. I plan. I advocate. I’m constantly on egg shells, trying to find a path in our fragile world. I often ask the sky to ‘give me strength’….if only just for the next hour.